This villa is unique because of the four-level design. The bedrooms are really spread out, so guests have privacy that can’t be found in other villas. The pool provides a common space to unite, and I’m sure you’ll be there often taking in the gorgeous view. 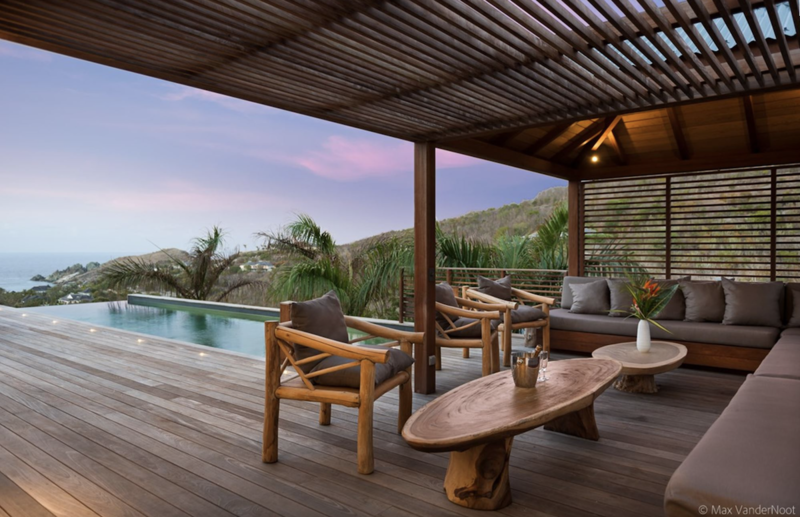 Villa Coco Rock is integrated into the secluded Petit Cul de Sac hillside, just a few minutes away from the beach. Highly recommended for non-family groups, Coco Rock has space for every guest to retreat. Coco Rock unfolds over four levels, starting with the parking area. The master suite occupies its own private bungalow and has a terrace with ocean views on the first level. An en suite bathroom has an outdoor shower. The swimming pool takes up most of the second level, surrounded by an expansive patio and lounging areas. Soak up the sun on one of four large sunbathers, or read a book under the pergola. A covered walkway leads from the pergola to the kitchen, dining area, and TV room. The kitchen features a large picture window, and three open walls in the dining and cooking area brings the outside in. The media room features a plush sectional and flat screen TV. The third level features a terrace and two bedrooms, each with an ensuite bath, queen bed, outdoor shower, and garden view. The fourth level features three additional bedrooms and a terrace. Two bedrooms have outdoor showers, and the third has the most privacy. The privacy makes this villa appealing for groups of friends traveling together. The kitchen island seats 12 guests for drinks and hors d’oeuvres, and the table on the expansive terrace seats 16. The living area features an expansive sectional in front of the TV.